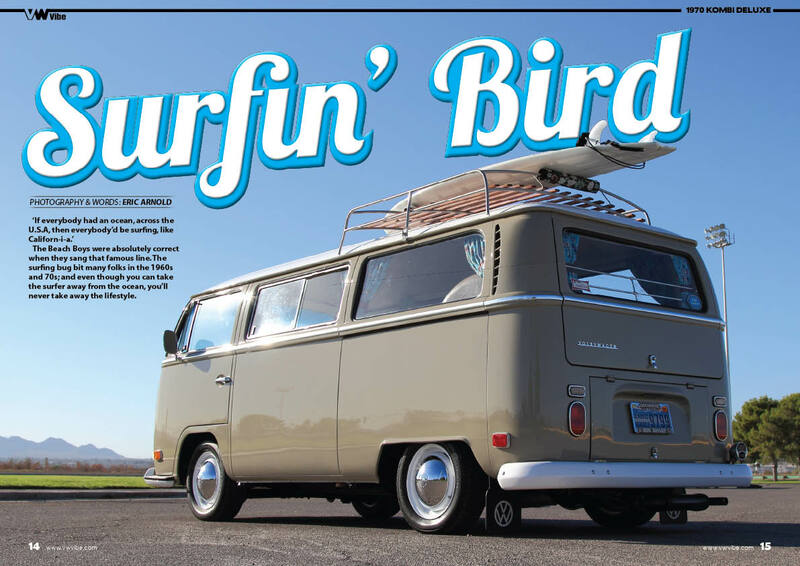 The VW captured its image of the anti-establishment and an alternative answer to car culture back in the 1960’s Californian surf scene, and from that point the reputation stuck and the iconic image of classic or custom VWs has to evolve and adopt many guises, from a Rat look early Beetle to a high spec Euro-stanced T5 – yet one theme is ever present… it’s a VW and thus celebrates the ethos of being that bit different… that bit cooler than the average bear! So if you have to keep it essentially air-cooled, or like the idea of a Bay window bus, but the budget of a T4, then we speak your language. 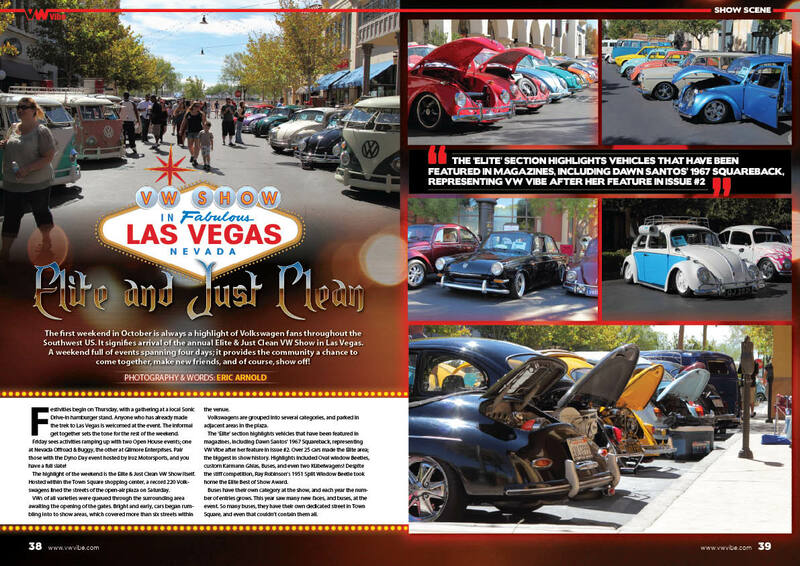 And whether you spend every weekend polishing your VW or throwing sandy surfboards or muddy mountain bikes into it, or you’re the family who simply loves getting out and camping, be it at the beach or a VW show… then this magazine is for you! Driving, owning or simply just enjoying the VW scene is not about status symbols, but about state of mind. With later incarnations of VWs taking on a heritage all of their own to sit along side the old skool classics, the galaxy of VW models and types is as varied as the individuals who drive and use them, but all share the spirit of fun and adventure that comes part and parcel to the VW scene and it’s many cousin interests, including exploring the great outdoors from inland odysseys to shoreline adventures to simply chilling at show, with a Radio Flyer full of cold ones and a classic cycle propped against the motor… if you like the v-dub culture, then you’ll love VWVibe! 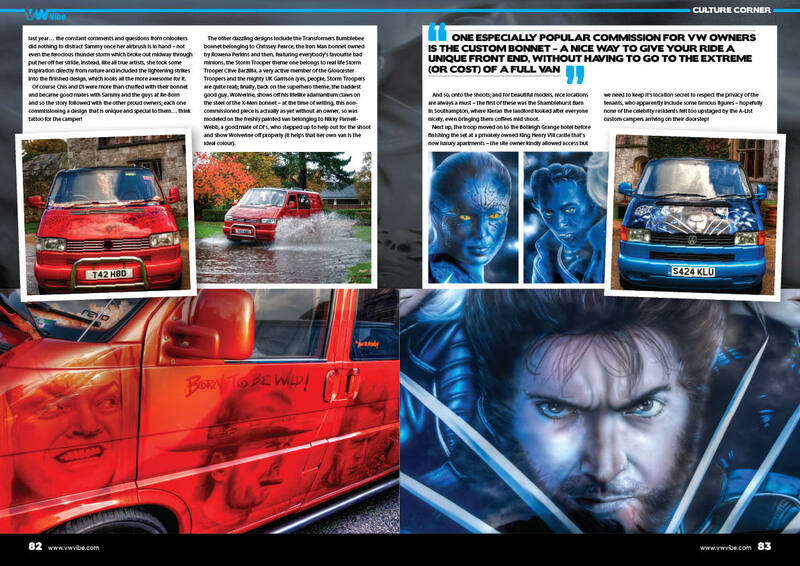 Our editor Ig is the man to speak to if you wish to get your vehicle featured in the magazine. If you attach a few photos of your dub and a brief outline of your story i am sure he will get back to as soon as he can. 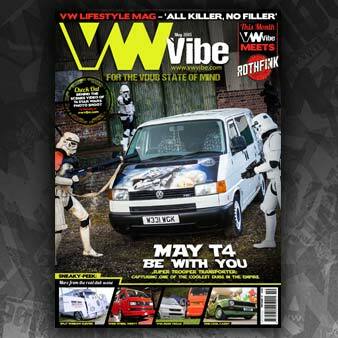 Hope this helps, good luck and you never know, we might be looking at your ride on the front cover of VW Vibe in the coming months. hey would it be possible to update the preview every month on this website? I met a lovely lady who works for you guys whilst we were both having our motors spoodled at the local hand car wash – she told me about the mag (haven’t been near a WHSmith to get one yet), but I wish you all the best with it. I have a 1990 LT35 with just 36K genuine miles (and in top nick) which I am slowly converting into a camper – there’s not may of them left that aren’t rusted to pieces these days – I hope maybe you’d consider featuring some of them that do in the mag (we LT owners tend to get forgotten – or are we not considered cool enough?). 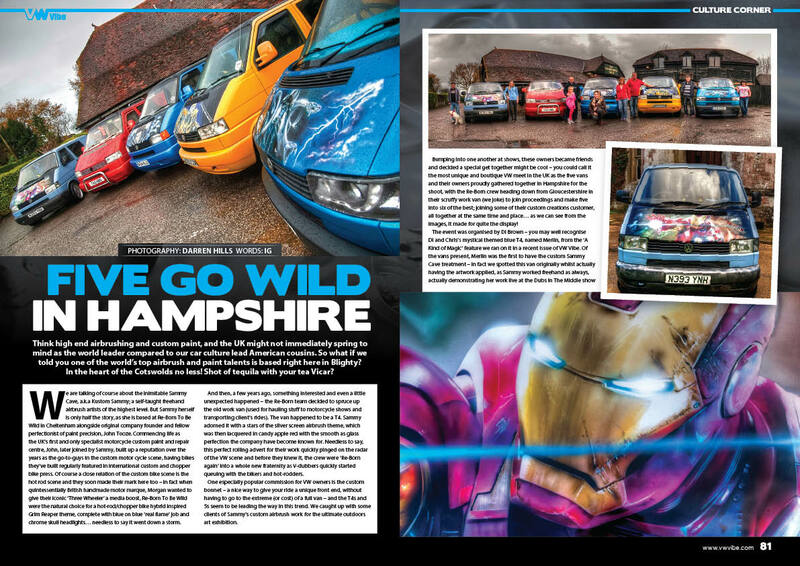 I used to be the editor of a trade mag (pro video/TV kit) and would be happy to contribute if there’s anything you need – I’m just down the road in Twyning, so could even pitch up at VWVibe HQ to help with drinking the team coffee! Hi, bought our first VW panel van this week ready to make a start on our much talked about camper project. Saw the magazine on the news stand and had to buy it (what great timing). We have read it from back to front and have so many ideas we can’t wait to start. Look forward to the next issue it’s great. 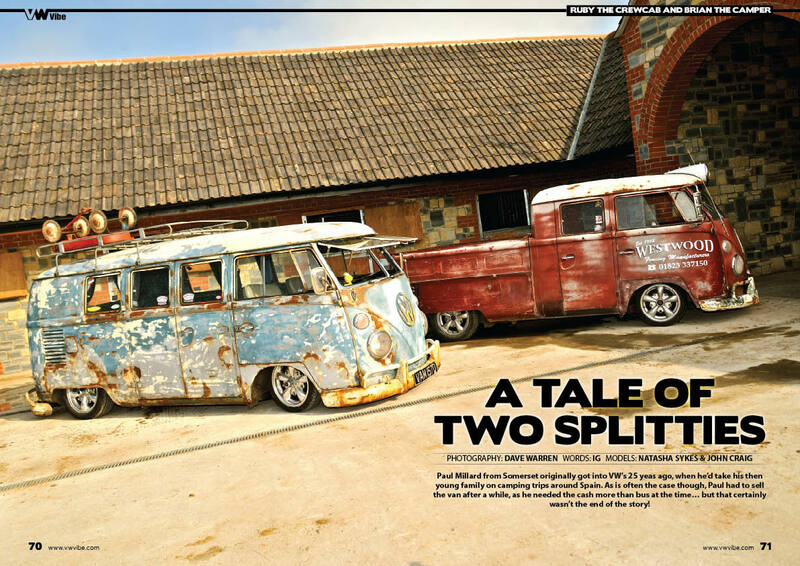 Just read the 1st issue & great to see a magazine finally covering the spectrum of loyal enthusiasts. 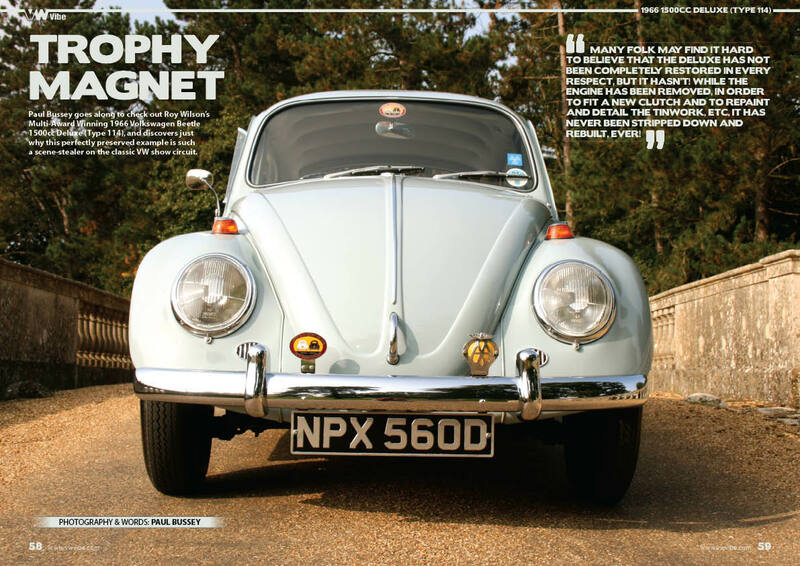 I a congratulations to you and the team it’s great to see something to cover the great mix of vw’s rather than biased views to one or another, I have always been around cars but it was only four years ago I got into vw’s this being a 66 beetle that had been in a bush for 22 years it’s now a shinny gp2 lwb beach buggy. To the wife’s dismay I am just finishing a T5 LWB T32 into a full camper. 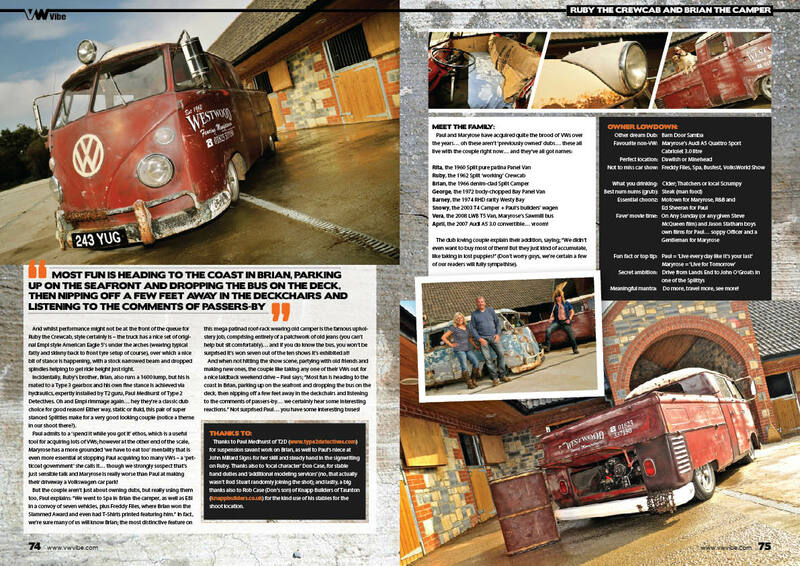 (If you want pics of the projects give me a shout) The new mag can now give me the enjoyment of old and new especially as another project probably won’t be allowed!! 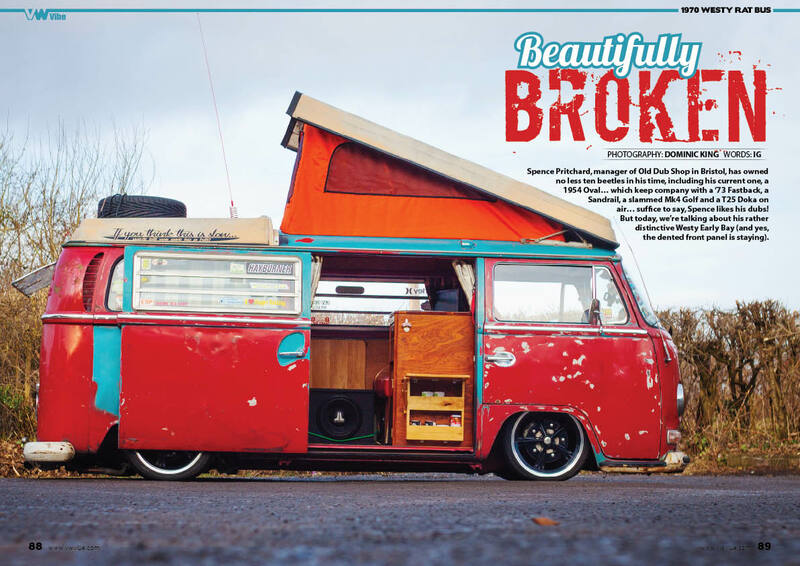 Well whats this i,ve spied sitting on the shelf at Smiths VW Vibe, Mmmmmm me thinks thats a good idea , the whole scene in one mag now thats my kinda read. 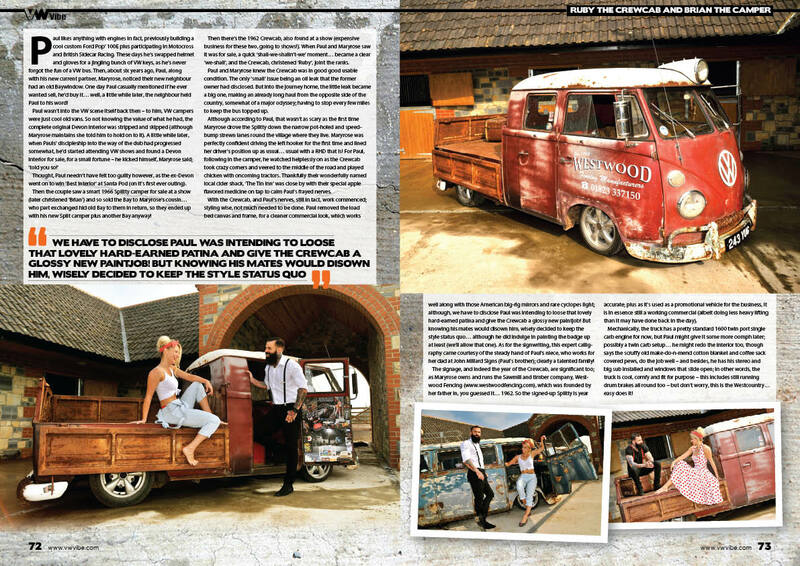 I wish you the very best in your new venture , great first issue it takes me back to when i purchased the first issue of Volksworld and yes i still have it!. Really looking forward to the next issue love reading about peoples adventures , different meets outside of the UK and a good mix of cool dubs from all generations. 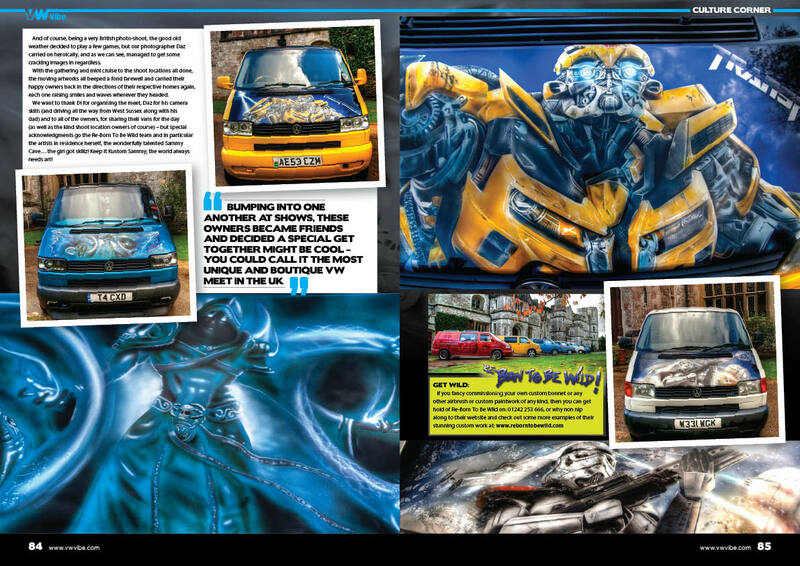 I hope to see a digital version of the mag at some stage in the future, now wheres my VW Vibe window stickers so,i can get sticker bombing 😉 . Ig is a true Vw love nut. I admire his passion in the Vw world. Very helpful individual who is packed full of information. Always look out for this gent at the shows. He’s a fella not to be missed. All the best ig. Leigh Davies. It really is as amazing as it sounds…. Fabulous articles, brilliant photography, and I should know …..seeing as I have watched this baby grow! With a creative and inspiring Editor IG, to bring you a fresh and exciting new mag, that rocks the hell out of all the other Vw mags on the shop shelves. Really looking forward to this new magazine. Just got into the VW world with my first camper, a T25 Autosleeper and love the old thing to death already! How about a VW music page or column, some new sounds to listen to on the freeways and byways. For me music and VW’s go hand in hand. We have a tape deck in ours and hunt high and low for old cassettes to add to collection. Be happy to contribute, I’m a music publicist by trade but also review and write about music on a few blogs and sites. Good luck with it all, looks GREAT! Would be interested in trading at our club’s day summer show, The Lazy Day 2014. Or donating something for our charity raffle & tombola. This year Wolfsburg Weed Huggers VW Club are supporting Child Bereavement UK. It would be a great opportunity to hit your direct target market, promote your company, support the scene, and help us support our local charity. • A Kids’ Zone field was very much enjoyed by the younger vw fans and made us a far more ‘family orientated’ show than usual. • The show was covered in magazines and in the local press, and some forum feedback rated us better than some far more established shows! We aimed the show at all the family, so we could please all of the people all of the time! The petrolheads had the show ‘n’ shine, auto jumble, VW Quiz and stalls, their partners could enjoy the craft stalls, Monkshood Coffee, maybe a fresh smoothie from Juice Dub or home made ice cream from Daisy Ice Cream, and the children were kept happy all day by the brilliant kids’ zone where they could do crafts, colouring, get VW tattoos, enter the football competition or play as long as they liked on the bouncy castle. Everyone else could dig in at the BBQ or the licensed bar. Plus all the time there was a real chilled-out Summer vibe from the live DJ spinning cool ‘lazy day’ tunes! There really was something for everyone. It was a great day which we want to make even greater next time – with your inclusion! The raffle was a big part of the show last time – it proved very popular and made all that money as we’d had so many brilliant prizes donated! Enough about the last show. We’re now looking for companies to trade at, or sponsor The Lazy Day 2014. For traders we’re asking just £15 for the day. If you’re not trading, a sponsorship of £50 can get your name and logo all over our advertising, our web page, and our Facebook page. We will also hand out your own fliers/stickers to the show-goers in the Lazy Day welcome pack as they come in, plus of course you’ll be ‘talked up’ all day over the tannoy. The donation of a prize towards the raffle from our sponsors would also be very much appreciated – the cool prizes really made a big difference last time. Prizes don’t have to be huge – we’re talking a car part, a T-shirt, a pair of show tickets etc. As most companies are already compiling their show events trading / sponsorship for 2014 and we are in the process of putting together the Lazy Day 2014 Web page, please contact us soon so as not to miss out if you’d like to be involved. Superb Fiona… sure we’ll be speaking more! Awesome Martin – sounds like we’re related! Drop ig an email at the address below will ya.